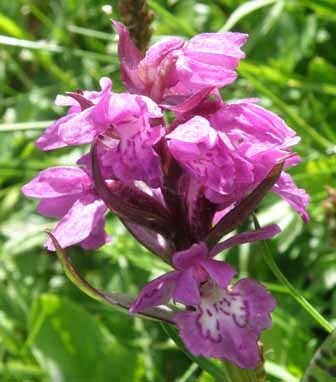 One of many marsh orchids, Dactylorhiza cordigera is distinguished by the heart-shaped lip of the flower from which are derived both its common and scientific names. This orchid has very darkly spotted leaves and dark purple flowers. The plant grows to around 40cm tall and is very robust, with flowers of dark purple patterned with even darker purple loops and streaks. The lower lip is distinctly heart-shaped, as can be seen from the close-up below. Dactylorhiza cordigera is widespread in the Balkan and Carpathian mountains, where often it occurs in large numbers. This orchid grows in very damp grassy meadows but also likes to be in the full sun; in the mountains of central and eastern Europe it can be found up to 2,400 metres above sea level. 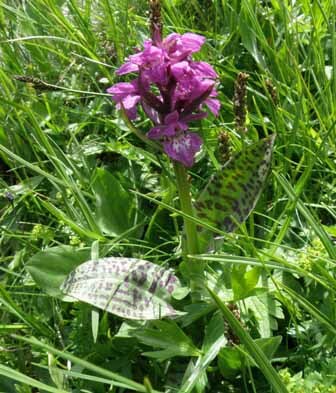 The flowering time of the Heart-flowered Marsh Orchid stretches from the end of May until the end of July - the greater the altitude, the later the flowering season. The specimen shown on this page was photographed in the Pirin Mountain range in Bulgaria in mid June.